Recently, I tweeted about the French instituting a fracking ban while Governor Cuomo partially lifted New York’s ban. What is fracking you might ask? 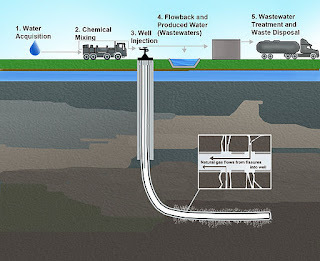 Properly known as hydraulic fracturing it is a process whereby a hole is bored into subterranean layers of shale (a sedimentary rock) and an undisclosed mixture of water and chemicals is injected at high pressures to crack the shale open and release the natural gas. The process of fracking is highly controversial, and was featured at length in the 2010 documentary Gasland (IMDB). The release of chemicals which naturally occur in hydrocarbon deposits is a potential source of water contamination. These chemicals include volatile organic compounds which can potentially cause kidney damage and benzene which is a carcinogen. Additionally, there is concern that the chemicals used for fracking might leach into the water table as well. The level of exposure to these chemicals in areas which have been fracked has not yet been quantified and it is not known to what extent leaching may occur. An examination of the map of major shale deposits in the United States shows 3 major shale gas deposits in the Appalachian Mountains between the Mohawk River Valley and northern Kentucky. One of these, the Marcellus Shale formation is estimated to hold up to 14 trillion cubic meters (TCM) of natural gas. To put that in perspective currently the US consumes 646 TCM of natural gas per day and produces 593 TCM of natural gas per day. Dr Gary Lash of SUNY Fredonia estimates that only 10% (or 1.4 TCM) of these deposits are recoverable using current techniques. About half of New York City's drinking water comes from the Catskills watershed which lies above the Marcellus formation. Any fracking which threatened the drinking water of 8 million New Yorkers and the reserve drinking water of 2.8 million Nassau and Suffolk county residents is a political non starter. Predictably, early reports seem to indicate that Cuomo will not allow fracking in the NYC or Syracuse watersheds or within 500 feet of a drinking water source. Thus it appears the new rules will lead to the development of fracking in the western third of the state. So what do I think about fracking? First off, clean potable water is a precious resource, more precious than energy. After all, you need water to live. Fracking has been utilized for many years in other states and in time cleaner and more environmentally sound techniques will be developed. New York should consider allowing fracking when such techniques have been perfected, not now.